Cross was a schoolboy Rugby star at Waverley College and played alongside the likes of Phil Waugh, George Smith, Matt Dunning, Adam Freier and David Lyons in the Australian Schoolboys sides of 1996 and 1997. In 1998 Cross joined the Sydney Roosters NRL club and scored two tries on debut against Manly. He went on to score 85 tries in 143 matches over nine seasons with the club, and topped the club's tryscoring list in 2003. In 2004 and 2005 Cross represented City Origin, and when he finished up at the Roosters in 2006 he was the club's fifth-highest tryscorer of all time. 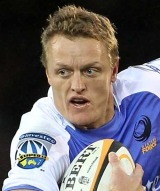 In 2007 Cross returned to Rugby with the Western Force and represented Australia 'A' that season. The following season Cross was named the Western Force Player of the Year and was rewarded with his first Wallaby jersey against France in Sydney. In 2010, Cross scored four tries in twelve matches to be the team's top tryscorer for the year before signing a one-year deal to return to Sydney with the Waratahs.